+ v. HOMER HORRES KERLEY5 (#998) ARENA JANE4 JOHNSTON (JAMES FRANKLIN3, GEORGE GREGORY ("G.G." OR "GREG")2, LEWIS1) was born in Randolph County, Arkansas, December 14, 1891 and died about 1946 in Pocahontas, Randolph County, Arkansas. His body was interred in Pocahontas, Arkansas. He married NOLA MAE INGRAM (#1996) in Randolph County, Arkansas, on December 22, 1912. NOLA was born in Randolph County, Arkansas, on February 9, 1893.
i. RECTOR E. KERLEY6 (#1998) was born in Randolph County, Arkansas, on July 26, 1913. RECTOR died January 1974 at 60 years of age. ii. LUCILLE KERLEY (#1999) was born in Randolph County, Arkansas, on September 13, 1914. Lucille died May 1980 at 65 years of age. iii. PEGGY FAYE KERLEY (#2000) was born in Randolph County, Arkansas, on May 1, 1917.
iv. CHRISTINE KERLEY (#2001) was born in Randolph County, Arkansas, on July 8, 1919. Christine died about 1980.
v. AZILE KERLEY (#2002) was born in Randolph County, Arkansas, on May 29, 1921.
vii. CHARLINE KERLEY (#2004) was born in Randolph County, Arkansas, on July 8, 1925. Charline died in 1987 at 61 years of age. viii. MARY LEE KERLEY (#2005) was born in Randolph County, Arkansas, on May 19, 1927. Mary died March 1996 at 68 years of age. ix. BENNY RAY KERLEY (#2006) was born in Randolph County, Arkansas, on September 20, 1929.
x. BERTHA MAE KERLEY (#2007) was born in Randolph County, Arkansas, on December 1, 1931.
xi. MARVIN EUGENE KERLEY (#2008) was born in Randolph County, Arkansas, on February 6, 1934. Marvin died March 1979 at 45 years of age. 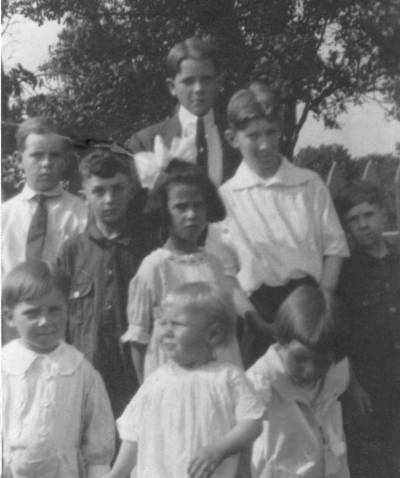 Children across front, from left are: OTTO CANNON, RALPH BENTLEY, ALICE BENTLEY, LUCILLE KERLEY, RECTOR KERLEY, and GENE CANNON. Behind them are: LOWELL CANNON, ROXIE KERLEY CANNON, MARVIN BENTLEY, and ALICE DOWNING BENTLEY. The woman behind Alice is believed to be her mother, ARABELLA DOWNING. 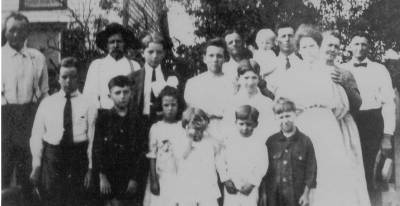 The 9 children in this picture are also in the picture above..
RUBY CANNON (left) and LUCILLE KERLEY in front. Boys are, clockwise from left front, RECTOR KERLEY, OTTO CANNON, RALPH BENTLEY, LOWELL CANNON, MARVIN BENTLEY and GENE CANNON.